Life at Busy Solitude Farm: Switcheroo! A week ago I noted that Goldie had taken to the nest. That would be the nest on the right, but who's there now?! The Cuckoo Marans mama hen! She's the second-best mama in the flock. 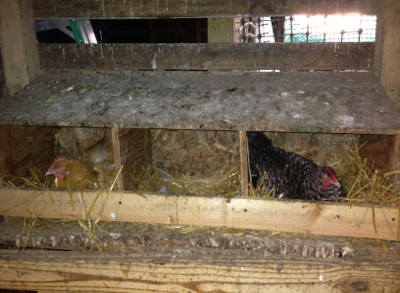 Apparently a few days of ten-minute egg sitting while Goldie took her constitutional switched on some hormones. Now they're both setting. No eggs for breakfast for me for a while! Stay tuned!